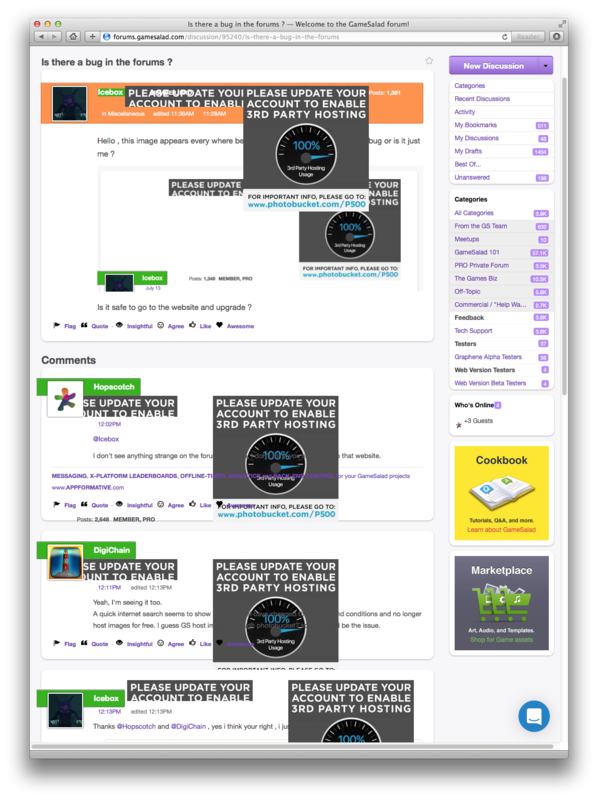 Is there a bug in the forums ? — Welcome to the GameSalad forum! Is there a bug in the forums ? Hello , this image appears every where beside every nickname here , is this a bug or is it just me ? Is it safe to go to the website and upgrade ? I don't see anything strange on the forums. And no, I don't think you should go to that website. Yeah, I'm seeing it too. A quick internet search seems to show Photobucket have changed their terms and conditions and no longer host images for free. I guess GS host images through photobucket? so this could be the issue. "Thousands of listings from online marketplaces like Amazon and eBay are now filled with unsightly error images by Photobucket after the photo hosting site quietly introduced a $399 annual fee to users who want to embed images on third party websites." Wonder if it is country specific? As I say, neither icons nor images in posts show this for me. Can't see a darned thing here either. Damned Photobucket! Yep, me too, pages filled with this stuff. I don't see this images on my computer. Whoa what is going on here?! Please update your account to enable 3rd party hosting. That is all. Sorry, not something I can help with. @ForumNinja??? Hmmm, guess it's all over the internet today. Broke tons and tons of websites and images all over the internet with the new business model. Guess it's time to switch to using imgur or something. I'm not sure why yet, but I think that it's having an issue displaying the little filled in stars. 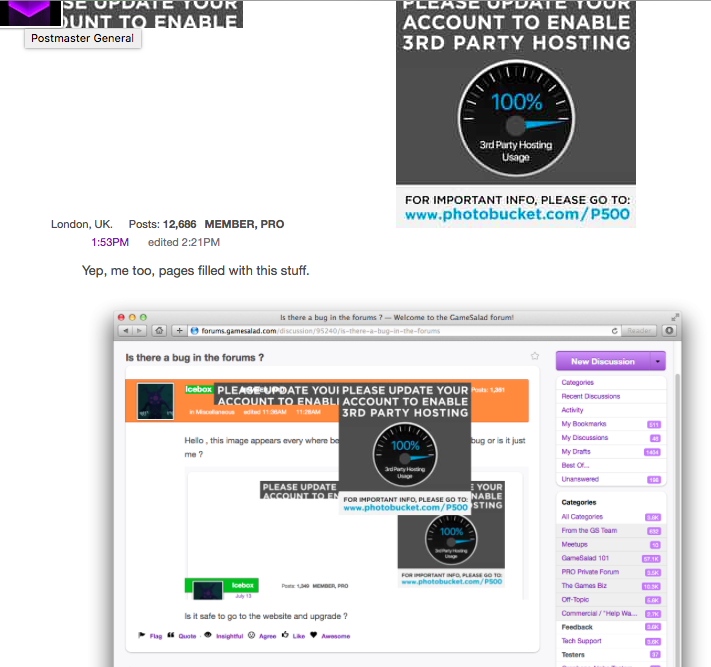 It's because they are hosted on Photobucket, along with the Pro badges. @Socks Just finished reading through this thread, yep! I'll try moving them over to a different hosting site / update the links to see if I can fix it. Hopefully, this doesn't mean we've now lost a shedload of invaluable information via all of the previously-attached image files since well, whenever?... I'm assuming that GS will have to maybe just pay a fee once to regain access to this info . . . I think GameSalad will have to pay Photobucket just the once to host any forum elements (like the stars or Pro badges), but forum users who want to use Photobucket will have to pay separately, of course no one is going to pay the $400, so I guess there are going to be a lot of forum posts with missing images. Its not even a one time payment , 400 $ / year , i doubt anyone would pay that much every year , not worth it . Pricing: The cost of a PLUS account varies according to how much storage you need! Please note, all subscriptions are billed annually. @Braydon_SFX Hey Bowlboy Sidekick, what happened to the watermelon pieces in my salad bowl badge? You eat them? It's a new bowlboy puzzle set! The completion of the age is determined by your forum rank. The higher you are, the more pieces you'll have. Hmmm, I see. You must be pretty old and rank because you are even allowed to put your head in the bowl.